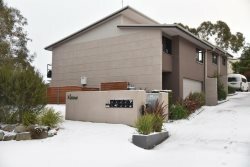 Rydges Horizons Snowy Mountains 405 is a 1 bedroom waterfront corner unit featuring a fully equipped kitchen and a living area with TV, DVD and Surround Sound overlooking Lake Jindabyne through large windows. The apartment is heated and cooled by reverse cycle air conditioning. The separate bedroom features King Split bed and a double fold out in lounge room to suit your sleeping requirements (4). Superior linen including extra large soft bath sheets are included. Apartment is serviced on departure. You have direct access to the lake and four kilometer walking track from your balcony through the sliding glass doors to enjoy a stroll or bike ride. Rydges Horizons Snowy Mountains Resort complex also includes indoor pool tennis,court, recreation center, licensed restaurant, bar, bistro and more for your comfortable year round holiday. Undercover parking for 1 car. There is no supplied WiFi at this property - You can access your own data though! or we can add 22gb of Telstra 4g with a mobile modem. Just select in our "Options" list when you make your reservation. Our properties are fully self-contained with full kitchens and laundries. Luxurious Crisp White Linen & Oversized Bath Sheets are supplied along with tea, coffee, hot chocolate, toilet paper and detergents for your entire stay with us. NO STARTER PACKS. There is no free WiFi but you can order a Mobile Broadband WiFi modem preloaded with 5gb with your reservation. Alternatively, you can use your own data allowance. A note on the cleaning products used in our holiday properties - We use ekoWorx a next-generation universal eco cleaning solution employing the science of green ionic chemistry. Their mission is to help eliminate the use of toxic chemicals used in cleaning products. The product is supported by the Asthma Council of Australia with their 'Sensitive Choice' label. Great team. Have stayed with them for years! A very good Horizons apartment, specially with the door between living area and bedroom, and with clever additions like hooks and extra storage space. Also on a corner, so have windows on two sides. The apartment was reasonable but is looking a bit tired - a coat of paint and some fresh furniture wouldnt go astray. There was a lot of noise from the apartment aboves washing machine/dryer which kept me awake. Given that it was snow season it was a bit hard to dry ski boots as well - cant really put these in the dryer We had a good meal at the restaurant at the Rydges and the location is good. Thanks Joan for your help, great location and unit was clean and comfortable. Very comfortable, spacious and clean. The Ray White team were always helpful and professional, and checking in and out was a breeze. 405 is a clean and well appointed unit, we will definitely stay again. The apartment is right on the side of the lake with great views. Its quite small but as others have mentioned its well kitted out and practical. There are loads of dishes and cutlery as well as hooks on the wall for hanging clothes and some cupboards. The heater kept it toasty warm as well - so much we generally had it on low. Its very close to town but there isn't a crossing on the main road so sometimes we had to wait for a break in traffic. Only really an issue early evening when everyone was coming down from skiing. Peter is also a great host, and provided personalised service at check in, and was available any time we needed him! Great place to stay - nice view and walking trail right outside the door. The unit was clean and tidy, and had everything we needed. It made out visit easy abs relaxing. Very good management by the local real estate agent Ray White Jindabyne. This is a practical unit in a fantastic location. We stayed here in summer and the access to local facilities is terrific. Beautiful view across the lake. Great unit close to everything. Right on the lake with a door to the foreshore and a deck to relax on. Perfect for 2 or 4 people. Peter was super friendly and knowledgeable, both when checking in and checking out - would love to stay again next year. We really enjoyed staying at 405 Horizons, the apartment was well appointed and maintained and perfect for a couple. The lake views were the icing on the cake. Friendly and willing to please. We LOVED our stay here - truly the perfect location on the lake. Good size to have a baby there and everything was clean and tidy plus they stayed back late Friday afternoon to give us the keys! I wish we could stay here again!! Ray White Jindabyne where so helpful and great to deal with. Stay as they are! Perfect place for the 2 of us. Plenty of fresh clean linen, kitchen is well equipped and so close to shops & cafs. 50% Deposit is required with booking, final & full payment is required 60 days before arrival date or your booking may be cancelled as an unpaid booking and could be re-booked by another guest. You will receive emails before this happens so please ensure that your email address is correct at all times.